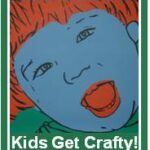 Welcome back to Kids Get Crafty. Today, I want to write a little about my passion and beliefs when it comes to art and adults and children alike having a go. I do talk about Pip Squeak a lot, but this applies to all ages! I hope I have succeeded incoming across “just passionate” and providing you with food for thought on getting crafty! 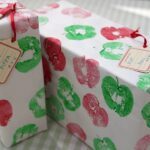 Also, don’t forget that this is also a link up party/ blog hop for all craftiness with and for children! Do take part. Do be inspired! Link up at bottom of post! Hooray! As some of you may know, I am a big advocate of “everyone can”, just give it a go. From adults to children. It is in part why I write this blog. I am passionate about creating and believe it is an important part of our well-being and development – and would love for others to Get Crafty, have a go and have fun. Build confidence in creating. There is a host of research on right brain and left brain development and why arts and crafts is such a fabulously wonderful tool to help our children grow and develop whilst exploring the world and having fun. I don’t want to go into those, what I “want”, is to get you “doing”. 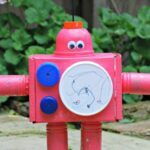 1) a parent “getting crafty” with a child and saying in front of them things like “oh, I am rubbish at drawing” or “I can’t make a robot wit you, I don’t know how. 2) parent saying:: “my toddler isn’t interested in crafts”. 1) Parents need to lead by example. A friend of mine who teaches music, once mentioned how surprised she was when at a music class for <5yrs: the children were already exhibiting embarrassment about their abilities – embarrassment that they had learnt from the adults around them. When an adult says to a child “Oh, I can’t draw a bus”, a child learns to feel that they can’t either. Or least that is my view….. We nurture a fear of failure, be it in singing or drawing “badly”. Your child will LOVE anything you draw or make for them. They are only 2 or 3 or 4 and haven’t learnt yet that plastic toys are viewed as superior. They will love you taped up carton robot or your elephant that looks like a pig! 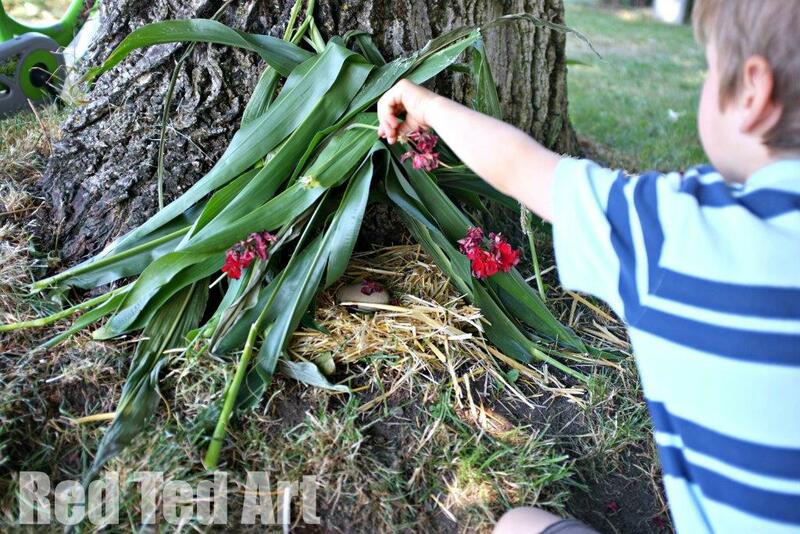 2) Children explore the world by copying. They see you hang the laundry and want to have a go too. They see you drive the car and pretend a box is a car they can drive too. They see you WRITING or DRAWING and want to have a go too… i.e. you don’t have to sit down and create artwork every day in front of them, but they see you writing something regularly, they will want to have a go at holding the pen too. I regularly find, that if I do something new with Red Ted, he wants to watch me do it first before he has a go (e.g. these snowflake stamps we made – he didn’t “get” the stamping bit, so refused to do it, but watched intently… next time round DID have a go). I would say both these points are about NURTURE. Yes, it is true that some children simply don’t like art, but that usually comes much later. There isn’t much literature on baby’s drawing or art. And I don’t really want to be precocious or pushy about the fact that Pip Squeak is already “drawing”. However, there is no harm in encouraging it, is it? Whilst blog hopping, I came across “someone’s blog” where the author was doing simple circle exercises with the baby. I can’t for the life of me remember who it was.. if it was you, please drop me a line and I can update this post! So I decided I could nurture Pip Squeak’s obvious joy in pen and paper. Pip Squeak and I got drawing circles. My, did she have a huge smile on her face. She loved it. 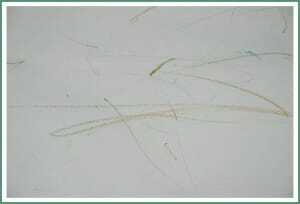 Below are some photos of different drawing sessions and drawing with her brother, as well as her very first “drawing” – “Scribbles in Gold”- Pip Squeak aged 9.5mths. If your child is showing NO interest in drawing or painting, don’t worry. After all we are ALL DIFFERENT with different interests. But ask yourself, do they EVER see anyone paint or draw? Have they got anyone they can copy? Do they have access to crayons, pens and paper? Could this be a reason why they are not interested? If in doubt, just start writing more in front of them. Show them that putting pen to paper is something interesting and let them have a go! I recommend chunky pencils – less edible than crayons and usually yield good results. I have found cheap, but good, chunky pencils in the supermarket! Go on. Go and paint. And now to our book! Celebrating that our babies CAN! I thought this book is hugely appropriate. 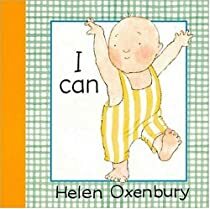 It is a lovely little board book, with a cute baby on each page showing us what (s)he can do: I can crawl. I can jump. I can bend. A great book for a “start up” library – definitely for the wee ones amongst us. Very sweet and will still grab their attention around 2yrs old. Definitely one of our favourites for Pip Squeak at the moment! And now I challenge you to go off and see what you and your children CAN DO! Nova at Cherished by Me shares her tips in Encouraging Children to Read. Gemma at HelloitsGemma’s Blog gives us her working mum tips in This working Mummy’s guide to life. Notes from Home: Kids help tidy. Chris at Thinly Spread gives us her Secret to Relaxed Parenting. Cass at The Diary of a Frugal Family shows us how she teaches her children about other countries and cultures whilst having fun in America Day. Helen at Cheeky Wipes gives us her tips in Fussy Eating. Mummy Beadzoid gives us some Parenting tips for the NICU/SCBU parent. Kelly at Domestic Goddesque shares her advice in Terrible Twos: tips for dealing with tantrums? Blue Sky at Looking for Blue Sky gives us some teenage tips. Tiddlyompompom shares her weaning tips in her oh so helpful guide to weaning. Mymumdom shares her tips in Parenting Tips (Me Over The Edge). SouthoftheRiverMum tells us her plans to set up a Reward System at Home. Not so single mum at Diary of a Not So Single Mum shares her advice on doing what you feel is best for your child and your family. Jax at Making It Up discusses behavioural issues in a quandary in search of a tip. Bod for Tea shares her advice on finding a ‘helper’ to encourage your child to do things they don’t really like doing in Bunny says. Hayley at Simply Hayley tells us about Hugs and Love. Interesting post! This is a lot like how I feel about reading, not in a phonics activity book sort of way, but exposure to books, modeling reading, and “giving it a go” even when they are seemingly too young, because it can never hurt. I’m a little guilty of saying my son doesn’t like arts and crafts, which isn’t entirely true (he likes it once we get going). He just takes more coaxing to get started on those activities than on others. One mistake that I think parents sometimes make is to design crafts that look great, but don’t really involve the child doing much of it. They make for good blog posts, but don’t necessarily inspire a love of crafting. I find myself torn in this way sometimes. Yes, that is a very tricky balance to find – and as a fellow blogger -it is in a dilemma I often find myself in! 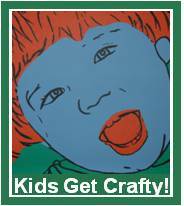 Especially since I want to bring craft ideas to a wide range of age groups. My approach is to run to parralel projects (if that happens), one where Red Ted gets to do what he wants and enjoy crafts on his terms and one where “I demonstrate” what you could do with older children that want to have a go and possibly follow instructions. I try to highlight the areas that he really isn’t interested in!!! And we do have tantrums in our house! Ditto reading. We love books and we are overflowing with then and my two were read to from when they were babies! I think we have a lot in common!! So glad you posted this. I know folk will be really interested in what is behind the passion! But yes… I think we often underestimate our children (be it with art or reading or on the climbing frame!!!)…. PS but also STRONGLY believe that “children should be children” and all learning is linked to fun and enjoyment. Plenty of time for “serious stuff” once school starts…. Well you know I am all for children trying out all sorts of activities as soon as they show an interest. 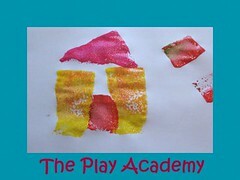 I agree with Lynn that we should focus much more on the ‘process’ of kids’ craft especially when they are young, letting them try out different colours, styles and materials without too much focus on the end ‘product’. I think you combine it well Maggy when you let Red Ted go for it, painting and drawing how he wants too, and then taking some of his art work to include in a little more ‘grown-up’ craft or toy to inspire older children. I have a friend who is an aspiring poet. 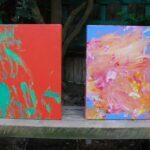 She takes her son (now 8 and diagnosed aspergers) on outings where they try different things like art and craft and so forth. She also lets him see her working on her poetry (I should add she works full-time) while he does homework or other activities. She has lately started going to poetry readings and taking him along…recently he entered a poem into the local country show and got up and performed it in front of a big crowd – and won a ribbon. All because his mum models creativity for him. Which is to say, I agree! Cathy – thank you for comment 😉 I do sometimes “fret” that i bend things too far my way… but the main thing is that Red Ted has fun and gets the chance to do stuff. And he loves seeing the final things I make – i.e. he can’t “visualise” things yet, so it helps him to see a finished item. Interestingly, he is learning to slowly follow instructions as he knows “something” nice will come out of it! Robyn – thanks for the Poetry example – HOW FABULOUS! Nurture at its best again!! Cool. My daughter started drawing at 11 months. My son (14 months) wasn’t interested until I gave him a marker. He LOVES drawing with marker, but not so much with crayons. He didn’t show interest though even though the 3 year old and I draw all the time. It’s like you said – each person is different. Thegirlwhopaintedtrees – You are totall right! And like how you didn’t “give up” but tried different things with your son to find what worked for him! Fabulous! That’s great that she’s already drawing! My 2 (aged 3 and 6)seem to have phases of interest. I don’t push them at all – drawing materials are available when they want them (they can help themselves) and of course they see me drawing all the time! Jude – I confess – Pip Squeak does lie drawing, but she also likes chucking ALL the crayons and pens on the floor in one big swoop – so I now have had to move them. But make a conscious effort to let her draw everytime Red Ted and I get crafty!!! I just found your blog. Love It!! I really have to get this book. I will be following you. Thank you for sharing. Very good post. I admit that I might have been guilty of mistake #1 – I am trying now to model excitement about art to my daughter. I am really appreciating all the comments today – I was a bit nervous about this post (especially as it was written in “passion”) and am so pleased to hear your support or agreement or that you are trying new things with your litte ones! When my daughter was very small, we played with crayons together. I had one notebook that I would draw pictures in like a car or pencil or would even color an entire page one color to help her learn colors. She liked to try and add her own special touches to the book. We still have it and she likes to look at it. Janelle – oh my, what a cute cute idea! I think I want to make one now… will have to go and find a small notebook (pretty certain I have some “Lying around”). Love it! draw or not, she is soooooooooo cute! What a cutie. I know my oldest little one is now 3 but she was definitely interested in using crayons at an early age. I remember her coloring her first father’s day envelope at 5 months old. My now-two-year-old was not interested in crayons except to eat them. I guess it is time to see if our newest little one is interested, come to think of it, seeing as she is almost 6 months old. By the way, both of them love coloring now and are getting quite focused, not as much scribbling, even on my 2 year old’s part lately. Of course she has her older sister as an example. If you want you could check out my You Capture photography post (which I will be posting later today), to see what they actually like to color. It’s not paper! (Though they do love asking for paper and pen/crayon/pencil/marker. I love the drawings and the book. It looks like you had a lot of fun at your house this week. Thank you so much for linking to Read.Explore.Learn! Interesting. I have 14 month old (today!) twins and I never thought about trying to let them color when their older brother is. I’ll give it a try. Oh! I thought it was there somewhere… but am on twitter as @redtedart ! Hope to see you there!! 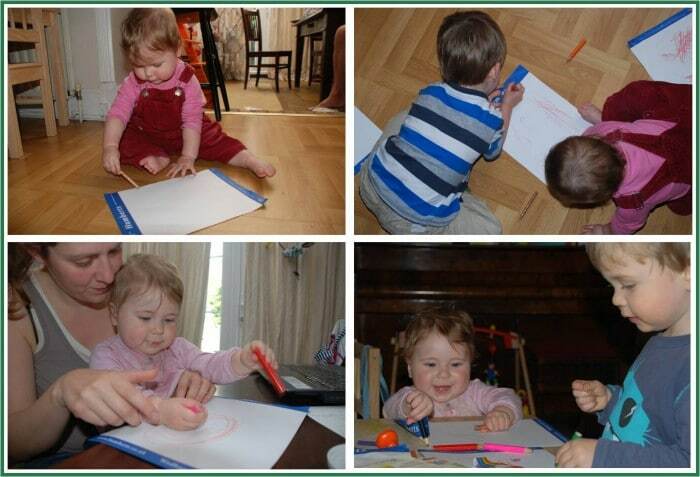 My youngest daughter JUST started to draw at 14 months, and she thoroughly enjoys it! 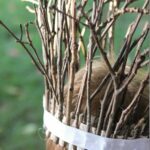 I wrote a similar post a while back about why I think kids should be encouraged to create in an open-ended way, and not always “set” crafts where the parent has a pre-conceived notion of the outcome. I believe it too! Kids are amazing! In our family the younger ones were much more creative at a much earlier age and I’m sure this is because they saw so much going on creatively in the house and wanted to join in and have a go! Thinking back, I probably didn’t do those types of activities with the older ones when they were babies and I wish now that I had. Oh I don’t think it is ever too late and I wouldn’t worry about having done anything sooner… There is plenty of time. I think I was just very excited about Pip and wanted to share the thought that if you let them have a go, you can nurture something… or simply that they may “Love” something way before you think they are ready! Sounds like your houses is already terribly creative Ella and that is all that matters! Oh Cass, you do SOOOO much and such wonderful things with them now, I really wouldn’t worry!!! My daughter likes to ‘draw’ with yoghurt and ketchup. I don’t like to discourage artistic expression but eeurgh. What a mess! Oh yes, very eeurgh! And very good of you to let her!! I hate it when my plays with her food!!! Hi-over from blog gems…I AM awful at all crafts..BUT I encourage my kids by having tons of things for them to create with..Three of them are passionate about drawing..I encourage them by keeping them in paper and markers-which we go through at an alarming rate. 🙂 I love seeing all that they do..it is lovely. 🙂 Your pictures are wonderful. You are so right! Children totally model what they see. My 9.5 month old is also drawing. She sees her big brother and myself drawing and painting and coloring all the time, so it is no wonder. I haven’t really thought about nurturing it yet, thanks for the idea, as I am sure she would love to be encouraged more in it and have the opportunity to do it more. 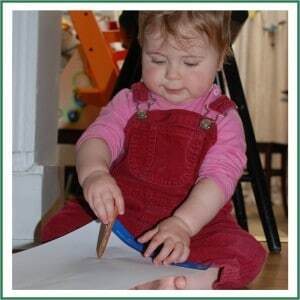 I love the photos of Pip Squeak drawing, she looks so happy and involved in what she’s doing! Absolutely agree with you on nurture. Before Imogen could hold a crayon I’d sit and draw with her and she’d enjoy watching me scribble away. It is wonderful to see them copy, isn’t it? !